Two Chicago air passengers said they were treated "like criminals" by an airline after voicing their concerns about an unattended bag on board a plane in late April. Chris Vinopal and Anil Mulchandani said they did not know each other before boarding a Spirit Airlines flight at O'Hare bound for Fort Lauderdale. But a bag under a nearby seat caught their attention. According to Vinopal, a neighboring passenger had moved from his seat during a delay at the gate and left the bag. Vinopal and Mulchandani said they did not see the passenger return as the plane started taxiing. "So we addressed our concern with the flight attendant," Vinopal said. The two men said the flight crew brushed away their concerns. "It was astounding they would not take our concerns seriously, instead just flexing their authority and telling us 'it is what it is,'" Mulchandani said. Two other passengers also voiced their uneasiness to the crew about the bag, according to Vinopal and Mulchandani. Just as they assumed the flight crew would investigate, they said the captain's voice came over the intercom. Indeed, the captain returned to the gate. Vinopal, Mulchandani and the two other concerned passengers were escorted off the plane by Chicago Police officers. They were also met by a representative of Spirit Airlines inside the terminal. A spokesperson for Spirit Airlines told NBC 5 Investigates the flight crew knew all along the bag was not a cause for concern. According to the airline, the bag belonged to a team member who finished the flight in the cockpit. But Vinopal and Mulchandani said the flight crew never told them that. "More than even humiliating, it was concerning," Mulchandani said. "The lack of security on Spirit's part. The lack of communication or even customer service skills." Spirit Airlines said some of the passengers used curse words during the exchange with flight crew members. Vinopal and Mulchandani deny being verbally disruptive. "At no time was anybody screaming or was anybody getting out their seat," Mulchandani said. The airline says it is conducting an internal investigation. The spokesperson also said Spirit Airlines takes safety very seriously and that this was an opportunity for the flight attendants to better communicate with customers. The passengers were refunded their ticket prices while in the terminal, but they were unable to finish the flight. 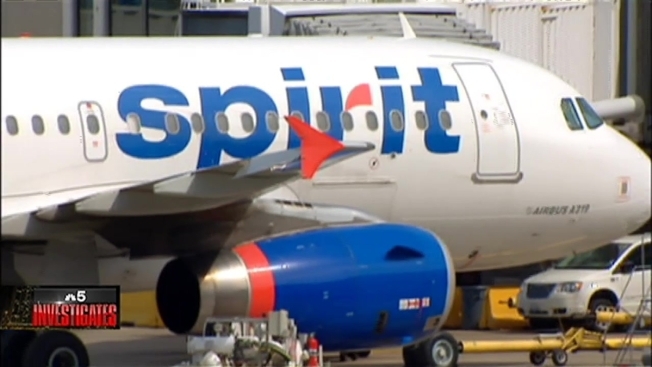 Spirit said it has since offered replacement flights to three of the four passengers they have been able to contact. Independent security consultant Neil Sullivan said it is best to talk to a flight crew discreetly when bringing up concerns. However, he urges the public to always speak up when you see something suspicious or if someone drops a bag and walks away. "It's best for you to move another way and find somebody in authority to be able to check out what's occurring there," Sullivan said. According to Chicago's Office of Emergency Management and Communications, authorities have received 287 calls about suspicious items since the beginning of 2014.